It’s never been an easy road for Christian metal band Stryper. With band-founding brothers Michael Sweet on guitar & vocals and Robert Sweet on drums, the Orange County, Ca. rockers were devout Christians who laid down guitar licks and kick drum beats with the best in the L.A. pop metal scene (with Oz Fox on guitar and Tim Gaines on bass guitar rounding out the lineup). Unfortunately, the band bounced back and forth in the public eye between platinum act with millions of fans, and go-to punchline because of their overtly-expressed religious beliefs and their yellow-and-black outfits. The setbacks never slowed down Stryper, though, and they did gain acceptance in the mainstream in the MTV era. Their major label debut album was The Yellow and Black Attack, followed by the platinum-selling To Hell with the Devil. Stryper released two more gold albums before breaking up in 1992, and then reforming in 2003. No More Hell to Pay, their latest album, was released in November 2013. We spoke with Michael Sweet about the color scheme, the videos, and competing with the top metal acts of the 1980s. Seems like a pretty exciting time, it now being over 30 years since Stryper began. I feel like I’m hearing more about Stryper in recent years than I ever did. Eddie Trunk is such a big supporter of you. Do you feel that Stryper is getting more love than they did, say, a decade ago? You touch on something interesting. Stryper has always had more of a battle in the pop music world. You guys are resilient in a way no other band has needed to be, at least in the early days when it was all about metal and the L.A. glam scene. You guys walk up and have a definitive Christian rock element. So you had to walk the line between delivering to mainstream and Christian audiences, and from what I read, two thirds of your sales were mainstream audiences. That’s absolutely accurate. Going on the statistics, I’m glad you said it, because if I had said it, I’d probably be referred to as a crybaby. But it’s true, those are the facts. We’ve had a bit more to overcome, and anyone who won’t agree with that doesn’t know the history of the band. When we go to Bulgaria and play with Dio Disciples and Dokken, with Glenn Hughes and Kamelot and a host of other bands, we are seeing a crowd that were entirely not the Christian rock crowd, and we’re singing about Christianity, and throwing out bibles, at first people are thinking, what in the hell is this? But once they lighten up and see the show, they realize and think, hey these guys are just a rock band out here entertaining us. It takes a while, and if you are out there you can see it happen. At the beginning of our set, it’s just two or three songs of observation. (laughs) And then once they’ve seen and heard us, and opened their minds and hearts to us, then they get into it, just like the band after us or the band prior to us. Stryper took an absolutely unique position. I don’t think any band accomplished what you did. You came up with the band name from the reference to the biblical verse, but why are the colors yellow and black? Well, some of it was planned, and some was not. 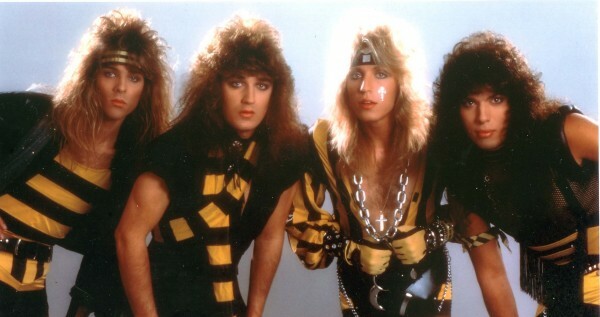 The yellow and black was around before we were Stryper. My brother liked yellow and black. It’s as simple as that. We used to get drunk and go out and steal road signs back before we were Christians. Yellow and black! And we’d hang them all over the walls of our studio. And Rob started taping his kit in yellow and black, and he said, hey can I do your guitar? I was reluctant, and I regret it now, because now everything is yellow and black! I think I heard you say that if you had to do it all over again, you’d rethink the color scheme. I say that, but ask my brother, and he’d say that there’s no way he’d ever change that. You hit on something interesting with yellow and black, though. Years ago, the makers of Cliff’s Notes were interviewed and someone pointed out that the yellow and black covers are very distinctive, which made them harder to hide and probably contributed to their popularity because you had to consciously hide them from plain view. Between that and road signs that restrict your movement, you might have tapped into a strange yellow and black phenomenon in the unconscious. Absolutely. My brother has always said that the yellow and black are colors of warning, all over the world — hazardous, be cautious, be careful. We used that warning idea once we became Stryper, but prior to that it was just yellow and black. That’s the truth. You guys were on MTV during the L.A. glam metal scene, so you scored some big video hits with “Honestly” and “Free”, as well as “Calling On You”. Do you remember shooting those. Oh, of course. We shot “Calling on You” at A&M in the Chaplin stages, where they used to shoot the old Chaplin movies. I remember it vividly. Wayne Isham was the director before Wayne had the success with Bon Jovi. I don’t know if this is fact, but I had heard that Bon Jovi liked our videos so much that he hired Wayne, and that’s how that happened. Kind of cool, and he went on to be Wayne Isham the huge director that he is. We released the “Calling On You” video and that wound up at number one on MTV, beating out Bon Jovi and beating out Poison and Motley Crue. We released “Free” and it went to number one. We released “Honestly” and it went to number one. We had this little run of number ones, and coming from a Christian band, it was unheard of. I think everyone was baffled and scratching their heads and saying, “What is going on here?” Again, the beauty of that is that MTV opened up a can of worms by asking people to call in and vote on the videos. When they did so, they got a rude awakening to the fact that we had a lot of fans. Which of the videos really caught the spirit of Stryper? I would definitely the “Calling on You” video. If you went to a Stryper show, that was pretty much it. That and “Free”. We started to get into that “over the top” style of video shooting, with the video “Always There For You”, “Shining Star”. We never had girls coming out on cars or roller coasters or any of that. We weren’t changing guitars every ten seconds and outfits every twenty seconds like we did in “Always There For You”, so it had become a bit more over the top. And with “Shining Star”, what made you want to cover that song? Was it scary shooting the helicopter shots in the video for “Always There For You”? Very. We went out over Long Beach harbor. I was scared to death. All I had between me and the water was a seat belt. The side was open, this guy was maneuvering, and I was wetting myself because I have a fear of flying anyway. I know it’s not video-oriented, but I see you served as replacement vocalist for Boston for a little while. Tom Scholz can be a bit of a taskmaster. Did you take anything from that experience and apply it to Stryper? I see. I’ve seen some YouTube footage and it seems like it was an interesting experience. Yes. It was a very interesting experience. You know, I was blessed to be a part of it, and I’m also blessed to not be a part of it. You can print that as I said it. That’s pretty much the gist of it. Catch Stryper on the road, their new album No More Hell To Pay at their website, and check out their latest video for the song “Sympathy”.